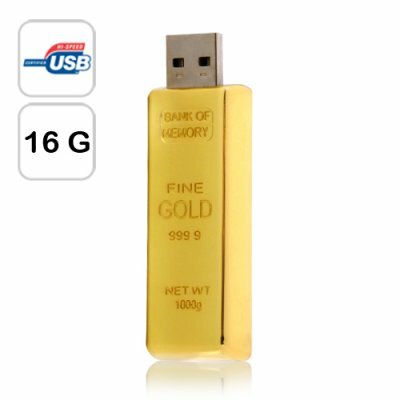 Successfully Added Gold Bar USB Flash Drive (16 GB) to your Shopping Cart. Handy new gadget, this 16 GB USB Flash Drive comes in the shape of a shiny 999.9 fine Gold Bar. Enjoy carrying around all your important computer files and data in this one of a kind USB Flash Drive. This dazzling Gold Bar USB Flash Drive can work with both PC and Mac, and it offers you the "gold" standard of data security with a virtually unbreakable, rock-solid metal casing and a retractable USB connector that can be pulled into the case when it is not needed. With its fully protected storage space and a High-Speed USB 2.0 Interface, you can use it as a long-term data storage device for your important documents, photo and videos memories and other valuable files. It's 16 gigabytes of memory is enough for literally thousands of photos, hours and hours of video, or thousands of MP3's. The Gold Bar USB Flash Drive is small enough that it can easily placed in your hand bag, wallet or pocket; or pack it with your laptop, cellphone or meeting documents. You can even wear it as bling around your neck to impress those gold-digging girls at the local bar. For security reasons, Chinavasion only stores a limited quantity of the 16 GB Gold Bar USB Flash Drive inside its vault. With our 100% wholesale price and express shipping services, it will make a handsome webshop item with huge resale potential. Don't wait, order yours now and we will ship it out to you tomorrow. What is the average life cycle of a USB Flash Drive? While the metal shell of our 16 GB Gold Bar USB Flash Drive is virtually indestructible, the average life cycle of the internal storage memory is 10,000 write cycles. Is it made of real gold? No, but its price is roughly 1 gram of gold (trading price from goldprice.org).